More than a year of negotiations might reach a breakthrough Friday, if Canada, the United States and Mexico agree on a rewrite of the North American Free Trade Agreement. The talks, which kicked into high gear on Monday — when U.S. President Donald Trump said he'd struck a new, preliminary deal with Mexico — had reached a "very intense rhythm" by the end of the week, according to Foreign Affairs Minister Chrystia Freeland. 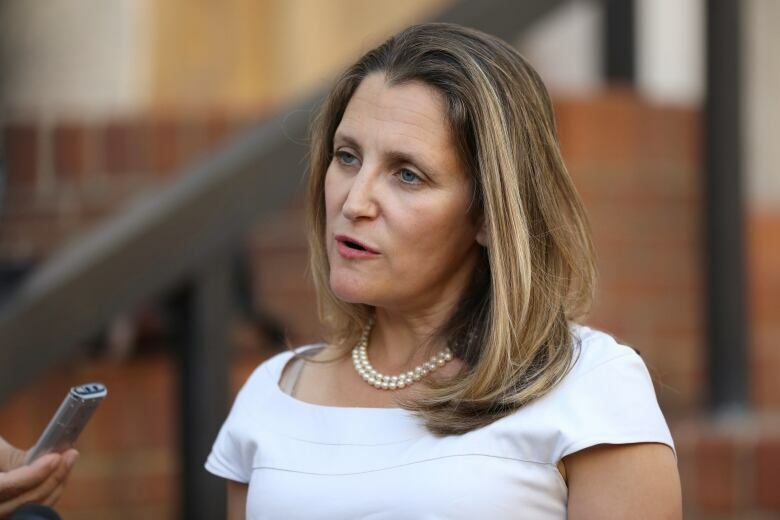 "We've all had a night to reflect," Freeland said on her way in Friday morning, adding she was looking forward to hearing what the Americans had to say. The critical objective for all three sides has been a new chapter on the automotive sector, which represents about a quarter of NAFTA trade. Based on Monday's announcement, Canada's likely signing off on new rules for determining what vehicles and parts are eligible to avoid tariffs. A new agreement could ease uncertainty in North American supply chains, and dodge Trump's threat of car tariffs as high as 25 per cent — at least for those vehicles that comply. But analysts suggest that, even without punishing tariffs, cars will be more expensive in North America and its industry will be less competitive globally. At least two of NAFTA's dispute settlement chapters are on the table. Chapter 11, which allows companies harmed by arbitrary government actions to sue, was watered down in the agreement with Mexico. Canada might approve, or lobby to go further. Ottawa agreed to suspend similar investor-state dispute settlement provisions and pursue a permanent court-based approach in its trade deal with the European Union. Chapter 19, which allows companies who feel their imports have been unfairly hit with anti-dumping and countervailing duties to request NAFTA panel arbitration, is something the U.S. wants to scrap. Canada has been fighting to keep it. Debate over NAFTA's dispute mechanisms comes as all three countries consider sweeping reforms to the World Trade Organization. The WTO could mediate disputes if efforts to strengthen it succeed, but Trump mused about pulling out of the WTO entirely again this week. As Jean Charest said, Canada is trying to find a way to allow Trump to say "I won" while still being able to say "[we]have not lost." Trump has made it plain that American farmers must be able to export more to Canada. The U.S. needs to export milk to deal with its chronic oversupply problem — one that Canada avoids with its strict production quotas. The dairy sector was said to be one of the last unresolved items as NAFTA talks continued into Thursday night. The egg and poultry sectors also benefit from Canada's supply management system. It's unclear whether they're on the table again too. Parts of the draft intellectual property agreement with Mexico — longer exclusivity periods for costly biologic drugs, or an extension of copyright terms to 75 years — could also be tough for Canada. Plus, as any trade watcher will tell you: Prepare for the fine print. Some of Canada's objectives seem like long shots, particularly if talks stick to a "NAFTA-light" scenario, focusing only on priority chapters, for speed. Canada might have wanted to open up government procurement, but given Trump's fondness for "Buy America," that feels like a tall order. Some industries wanted to revise labour mobility provisions, updating a list of professions to include jobs that didn't exist in 1993. 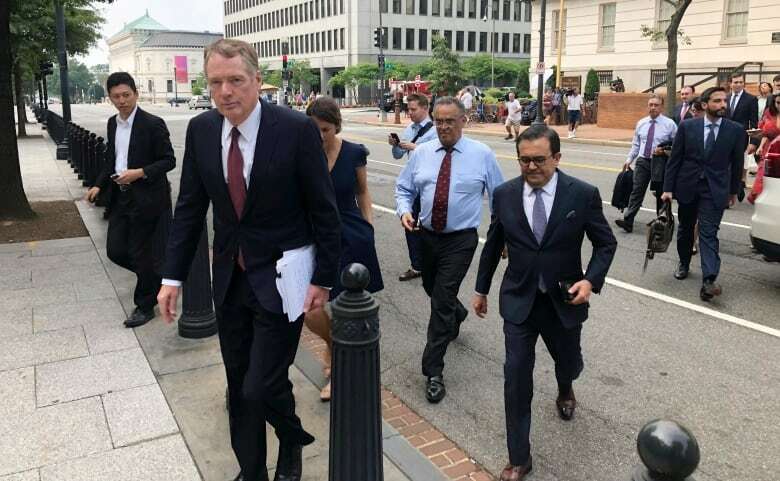 But on Monday, asked if the number of NAFTA Professional (TN) visas would change, one U.S. official said bluntly: "No." The Liberal government promotes its "progressive" trade agenda, aimed at keeping key voters onside. While more labour and environmental protections are expected, it's unclear whether the tight negotiating timelines allow a gender chapter, as Canada's added to other agreements, or an Indigenous chapter. The U.S. wanted a five-year sunset clause on the entire, renegotiated agreement, but its deal with Mexico backed that off to a 16-year term, renewable following a six-year review. You'll never hear American officials say it, because Trump thinks Barack Obama's trade agreement with 11 other Pacific Rim countries was a horrible deal. Part of why Canada wanted to join the TPP negotiations, alongside the U.S. and Mexico, was that it was a NAFTA do-over: a way to update chapters written in the early 1990s. When the U.S. gave up on the TPP, it needed a do-over: updating NAFTA. "There literally is not an area where we didn't 'plus up' what we did before," said one U.S. official, who was asked what was different. If all three countries reach a new NAFTA, pull out the TPP text and compare. Officials said an agreement will be notified to the U.S. Congress on Friday: either a deal between the U.S. and Mexico, which Canada could join, perhaps within the 30 days before a final text is due, or a new trilateral deal. Meeting this deadline means the outgoing Mexican administration can sign it before its Dec.1 handover. A lot could still go sideways. A new U.S. Congress will be elected in November, and those lawmakers will vote yea or nay on the Trump administration's work. Critics already predict a vigorous debate about whether this is really a better deal. The incoming Mexican administration sat in on the final talks, but if Mexican opposition ramps up, it's unclear how the new president, Andres Manuel Lopez Obrador, will respond. Canada's federal election is a year out. But a large loss for the dairy industry could be expensive for Finance Minister Bill Morneau's pre-election budget: the Harper government's concessions in TPP came with a compensation pledge of over $ 4 billion. Provincial elections are also on in New Brunswick and Quebec, where a big dairy concession would be big news. Canada and Mexico will want the U.S. to de-escalate their steel and aluminum tariff fight, and provide assurances car tariffs are off the table. Watch to see if Canada ramps up its emergency safeguard measures in return, to guarantee Trump that cheap foreign steel isn't entering North America.